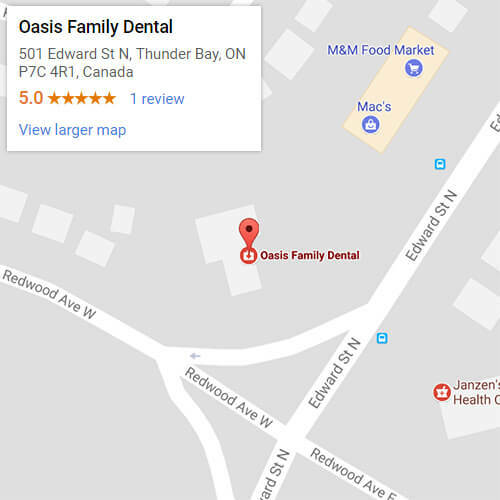 Dr. Chow and our staff at Oasis Family Dental understand that our patients might have questions about dental implants. Our patients also want to learn more about the advantages of dental implants equated to alternative tooth replacement options. For this reason, our expertly-trained staff has formulated this page of useful information to answer as many common questions as possible. Additionally, if you have any further questions, please contact our office, or leave your information in the submission box and we’ll get back to you as soon as we can. A dental implant is made up of three components: the fixture, the abutment, and the crown. The implant fixture—usually made of titanium—secures the implant in place by performing the same function as the roots of your natural teeth. The abutment acts as the link between the fixture and the porcelain crown. The crown is set on top of the abutment, finishing your dental implant. The crown is custom-made to blend seamlessly with your smile. Can any dentist perform implant surgery? Dental implants call for precise placement to decrease complications and prevent dental implant failure. For the best results, it’s vital that you find an implant dentist with the necessary education, training, and experience. Fortunately, Dr. Chow has the essential skills needed to safely and effectively place your dental implants. She received her Doctorate of Dental Medicine from the renowned University of Manitoba. Why do people prefer them over the alternatives? More people than ever are choosing dental implants because they have the most natural appearance and feel of any of the replacement options. Dentures and other tooth replacement options move around in your mouth when you eat, drink, and socialize—but dental implants won’t. Another major benefit of dental implants over dentures is that they reverse some of the negative effects of tooth loss, like jawbone depletion and gum disease. It isn’t possible to convert dentures into dental implants because a denture does not have a titanium fixture that can bond with your jawbone through osseointegration. However, it may be possible for Dr. Chow to replace your current dentures with implant-supported overdentures. This solution provides the durability of dental implants with the restoration ability of dentures. Following your procedure, you should expect some discomfort, swelling, or bruising. The use of over-the-counter anti-inflammatory drugs, like ibuprofen, can mitigate these effects. One helpful tip is to remember to ice the affected area. You can significantly decrease the swelling and inflammation by placing ice on the sore area on and off in 20-minute intervals. Surgery time varies depending on the number of dental implants you need. Usually, one implant takes around an hour and a half. If you’re having multiple dental implants placed, it will take about three hours to complete. Dental implants last longer than the two most common tooth-replacement alternatives: dentures and dental bridges. If you care for them properly by brushing, flossing, and maintaining good oral health, your dental implants could last for many years. We hope these FAQs have been helpful. If you have any more questions, give us a call to arrange a free consultation with Dr. Chow.